This new and innovative treatment option is used to treat the smallest of spider veins that can often be too small to be treated with microsclerotherapy or are recalcitrant to previous microsclerotherapy treatments. The VeinGogh system uses a pen like stylus which holds a needle almost the size of a human hair to deliver a “microburst” of controlled energy just under the outer layer of skin, but above the vessel. The energy pulse specifically targets the vessel wall and heats it instantly, causing the vessel wall to collapse and eventually get absorbed by the body. This process is referred to as “Ohmic Thermolysis” and is very safe and virtually pain free. 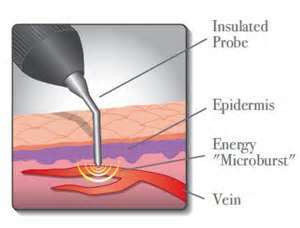 Ohmic Thermolysis treats the spider veins while leaving the outer layers of the skin unaffected. The treatments can be done alone or in conjunction with conventional microsclerotherapy and take less than a half-hour. Although some results may be seen immediately, it takes several weeks for the treated veins to be reabsorbed by the body and for the full effect to be seen. Following the treatment, there will be some mild redness that usually lasts no more than a few hours. Applying an Aloe Vera gel or your favorite moisturizer provides additional comfort and eliminates any post treatment dryness that may occur. Patients can resume their usual daily and exercise routines as well as outdoor activities immediately following their treatment. The VeinGogh system works well for spider veins on the face, rosacea, and cherry angiomas (red spots). At Middletown Vein and Aesthetic Center we are one of only a few centers in Connecticut to offer this revolutionary state of the art treatment option and have been using it for years now.